A tone-deaf sartorial decision — or a hidden message from the first lady? And if so, to whom? The images of Melania Trump sporting the olive green khaki jacket on Thursday as she boarded a flight to Texas — which immediately went viral — surfaced as the White House struggles to calm international anger over the practice of splitting migrant children from their parents. 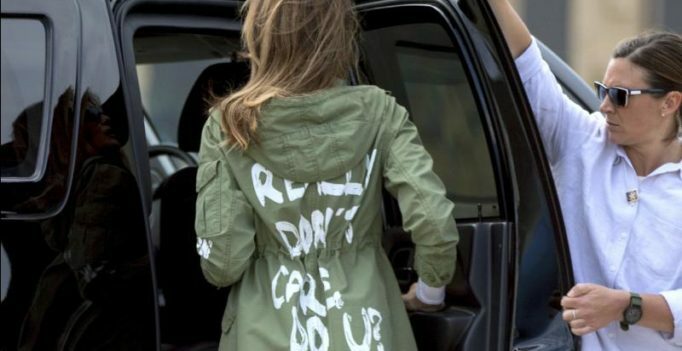 Asked about the military-style jacket with large white brush-style lettering — apparently sold for USD 39 at Zara, according to the Daily Mail which first spotted the odd choice of outfit — the first lady’s spokeswoman Stephanie Grisham said “there was no hidden message.” “It’s a jacket,” Grisham said. “After today’s important visit to Texas, I hope the media isn’t going to choose to focus on her wardrobe.” “#SheCares #ItsJustAJacket” Grisham tweeted later on, as speculation swirled online. When she arrived in McAllen, Texas the first lady had changed out of the controversial garment into a cream button-up safari-style jacket. But upon returning to the White House she sported the jacket once more, despite stifling heat and humidity in the Washington region. Melania Trump’s unannounced trip to a youth shelter for migrants and a Border Patrol processing center came one day after President Donald Trump made a sudden decision to end the practice of splitting immigrant families that has left more than 2,300 minors separated from their parents or guardians. The first lady herself called for political compromise to end the stripping of children from their parents — the result of the Trump administration’s “zero tolerance” policy against illegal border crossings, in effect since May. It was not the first time Melania Trump raised eyebrows for her fashion choices when out in the field: last year she wore needle-thin high stiletto heels to observe the devastation wrought by Hurricane Harvey.